Nothing stops the flow of creativity more than comparing myself to others. Usually I’m comparing my insides to their outsides. My rough draft to their finished book. My internal mess to their polished perfection. Comparing makes me insecure. I look at the work of others and all my doubts surface. In my mind, questions arise about my abilities. Inspiration is lost and work stops. God has created me and He knows me. He has given me the ability to write. I want to be confident in my work. Comparing makes me ungrateful. I can be pleased and thankful for my work – then I walk into a bookstore and begin to compare. I no longer appreciate the unique words that God has given just to me. I am no longer content with what I have. God has blessed me with the gift of writing. I want to rejoice in that. Comparing makes me judgmental. I can find myself looking for the weaknesses of others to bolster my own pride. I need to watch out for any thought that starts with, “Well, at least I didn’t . . .” Each of us has a unique calling to write. We should always examine ourselves, not others. God has given me colleagues in writing. I want to rejoice with them. Comparing pulls me off course. I can lose heart and focus when I am concerned about what others are doing instead of the work that God gave me to do. When I am too busy watching others, I am not working. God has called me to write. I want to be productive in my work. How can we avoid the comparison trap? I must keep the focus on God and what He has for me to do today. Then I can appreciate my work, be grateful, celebrate the work of others, and stay on track. Simple! Or is it? How about you? Do you compare? 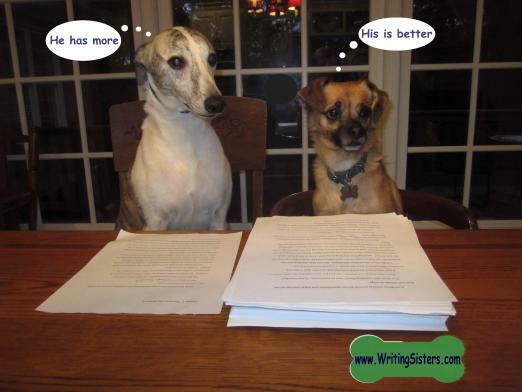 This entry was posted in Writing and tagged Betsy Duffey, comparison, encouragement for writers, faith, God, Laurie Myers, writing, WritingSisters by Writing Sisters. Bookmark the permalink. I compare myself against myself forcing improvement in my writing. Each new piece should be better than the previous one. Thanks for your comment, Robert. Good reminder. I compare all the time! And I hate myself for it!! Luckily, it’s like you said: If we stay focused on what God has planned for us, then we aren’t so apt to compare. Also, my pastor said not too long ago that when we take our eyes of our own journey, sizing up another’s, then we are in essence doubting that God has a perfect plan for us. Heather, I love what your pastor said. It’s so true. It’s good to have people in our lives to encourage us to stay on track. Other people can help us by speaking truth into our lives and validating our journey. Your thoughts were very well expressed and spot on right. I appreciated the Mark Twain quote as well. What great wisdom to start my writing day off with. Thanks! Thanks, Elaine. Hope your writing goes well today. This is so on target for me, since I am easily intimidated when I compare my work to others, which I do all the time. (Can you say ‘overly competitive’ and ‘insecure’?) I need to post this column on every wall in my house to remind me that God’s plan is perfect for me, and leave everyone else to their own paths. Thank you, Writing Sisters, for calling me out on this and giving me hope! Thanks, Jan. Totally relate to the word “insecure”. Usually we write a post because we need it so much ourselves! I always like to share the posts that trigger something in me. This post is worth the share for anyone else who struggles with comparing. Thanks for sharing this, Cara! I’m glad that it was meaningful for you. whenever I read something excellent, I remind myself their success doesn’t diminish me. It should inspire me. Thank you for this post. I am a “newbie” having only recently put pen to paper, er, fingers to keys. I know I am not a Eudora Welty, Toni Morrison, or a Flannery O’Connor so why even bother? Oh ye-ah, I want to give my child a few things to read and remember that came from inside my very being and maybe bring a smile to someone else’s face along the way. Comparing can be especially discouraging for newbies! Flannery was a newbie once, right? I love that you are thinking of your child as you write. No one else has the words that you do. This is so important for me, in particular, to remember. Thanks for your words of wisdom, ladies! Thanks for your comment. Good to see you here! There is so much wisdom in this article by The Writing Sisters that I had to share it. The wisdom goes well beyond the writing world and applies to every aspect of our lives. Thanks, Linda. We appreciate your kind words and encouragement! Comparing is not just a writing issue and I am thankful that you shared the post with your readers. This is a timely word for me, and not just about writing issues–thank you. Thank you for this post. I tend to drift towards comparing, as well, and usually end up thinking my own writing is inadequate. You’re absolutely correct – no one can write like me or say what I say, how I say it. And God meant it to be that way. Thanks for the encouragement! Thanks for your comment, Rosemarie. I’m glad you liked the post. If you desire to improve and move into what God has for you, it’s essential to avoid horizontal comparison. That will only deter you, and fill you with doubt and unbelief. God has designed an individual plan for ME, it’s part of His overall will for my life. If I believe that, then I’ll not look at what God has given others to do. I’ll rejoice with them, but I must remember to keep my eyes on what He’s given ME to do! When I do, I’ll certainly arrive. Well put! Thanks for your comment. Now “compared ” to the above comments, mine might seem pithy ( there I go again, comparing myself) but want to say two things: thank you thank you for your writing, dear sisters, and the gathering of fine wisdom and love your followers show . It is truly uplifting. And I try remember to focus on what I am writing not how others might read me. In writing self-consciousness is paralysing. Thanks for your kind words and for taking the time to respond to the post!